Safety first, cowgirls! It's not worth the risk of hurting yourself or your horse. Your horse tack should be in good condition. Watch out for extreme wear and tear. Riding can be a dangerous sport! There’s ways to make it safe by following a few precautions. The last thing anyone wants is to injury themselves or their horse. Make a habit of putting safety above everything else. It doesn’t matter if you’re a beginner or experienced rider, being careless can cause accidents. Follow these tips and you’ll have a safe ride! 1. Wear a helmet: One throw and you could be severely injured if you aren’t wearing one! Make sure it’s ASTM approved to guarantee it’s been tested for horseback riding. With all the colors, designs, and fits on the market, you are bound to find the perfect one. 2. Proper boots & riding apparel: Your boots should be designed for being in the saddle. That means a small heel and hard toe. You don’t want your feet slipping through the stirrups! Riding in tank tops or shorts can cause chaffing and bad cuts, especially if you were to fall. 3. Safe riding equipment: Have you checked your tack lately? 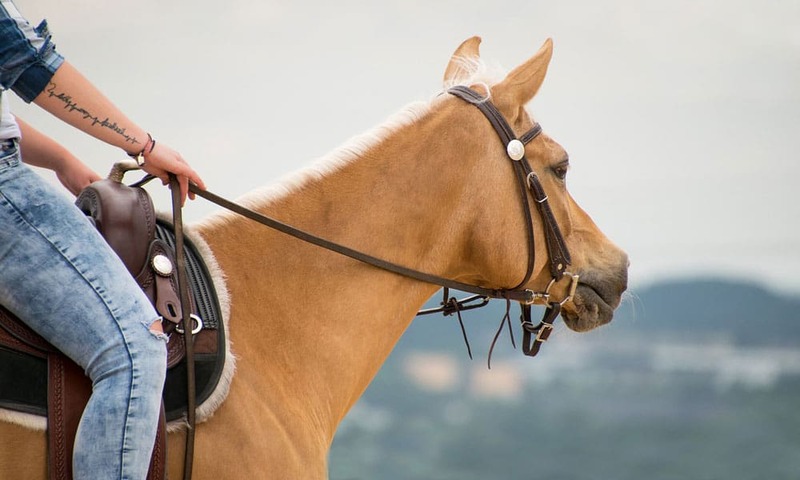 A faulty piece of leather can make your headstall fall off while riding, and no one wants their saddle spinning under their horse because of a bad strap. The best time to check is when you’re cleaning tack and right before you ride. 4. Don’t push too hard: Know your level! Galloping across an open field may seem like a dream, but an out-of-control horse probably isn’t. It’s healthy to encourage yourself to achieve goals. However, unnecessary risks can make for a very unsafe ride. Take small steps, rather than huge leaps. 5. Find an experienced instructor: What a good way to stay safe! An experienced trainer can show you the ropes of horseback riding. They will guide you through the process and help you feel more comfortable in the saddle. By following a few precautions, you and your horse can be safe!